John Russell was having one of those John Russell sort of games. 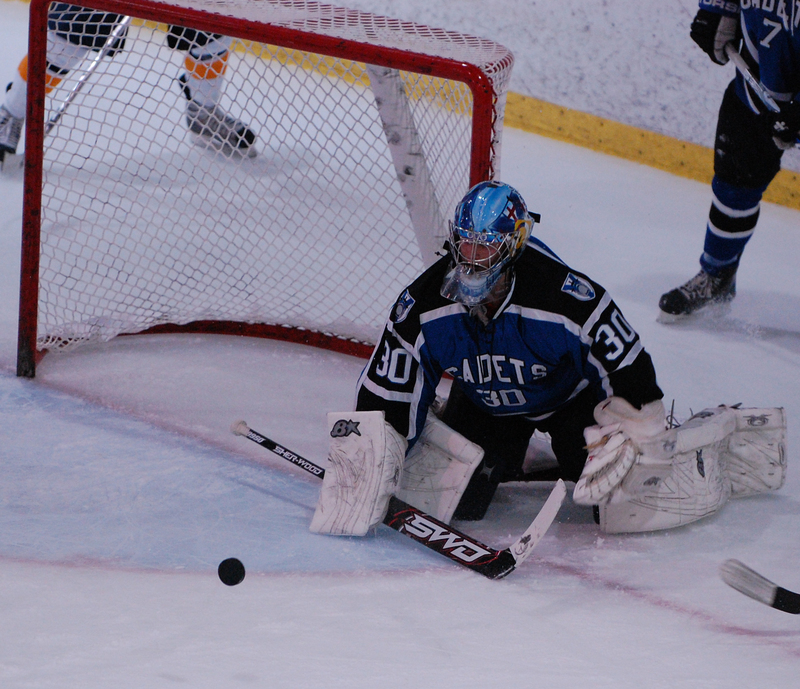 He was down in the butterfly, he was up on his feet, he was diving across the crease, he was standing on his head. 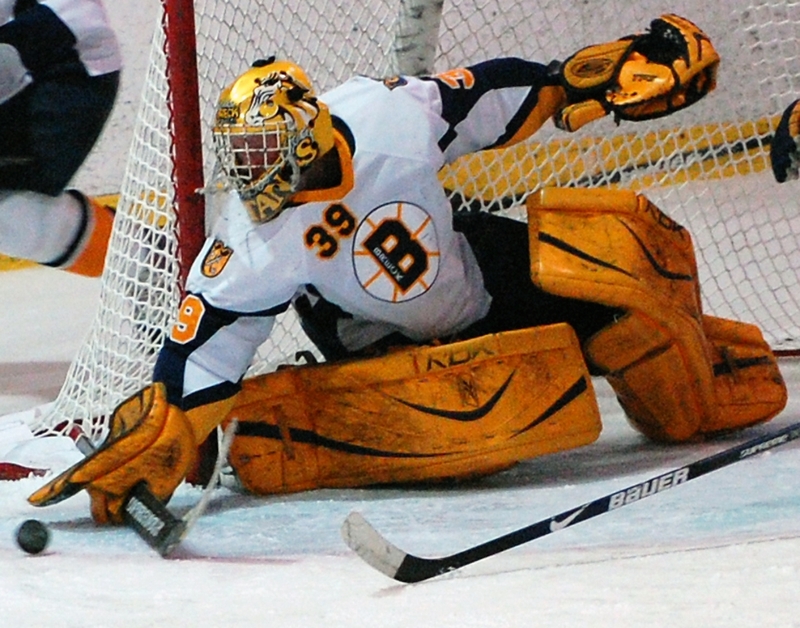 That last part isn’t true, of course, but if this goaltending thing doesn’t pan out (not likely) the acrobatic Breck senior is a cinch for a starring role in the Cirque de Soleil. In a matchup of No. 1 vs. No. 2 in the state in Class A, it was No. 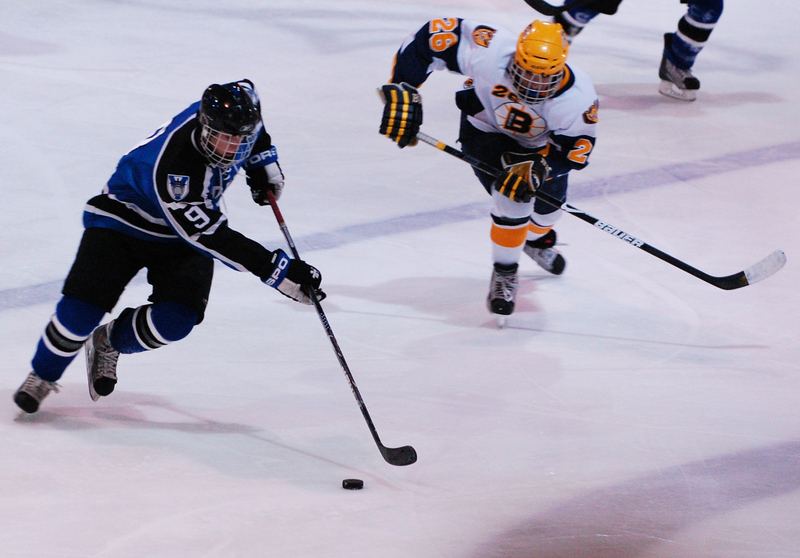 39 who did everything but lead the forecheck and run the power play in a game dominated for long stretches by St. Thomas Academy. And despite Russell's heroics, the No. 2 Cadets will undoubtedly move into the top spot in the rankings after ousting the No. 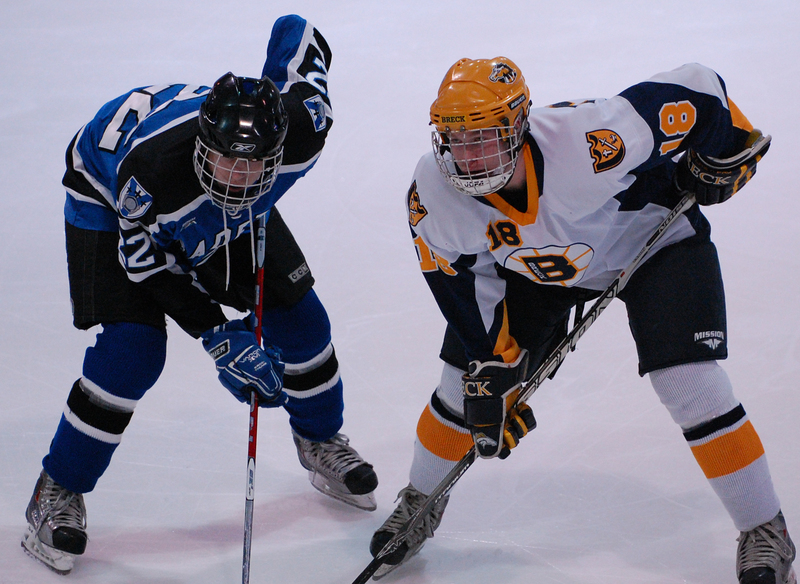 1 Mustangs 4-3 in overtime on Tuesday, Dec. 8 at Breck Ice Center in Golden Valley. In the first period alone, Russell stopped so many point-blank scoring attempts for the Cadets he might just as well have been a Pinata. About that goal. 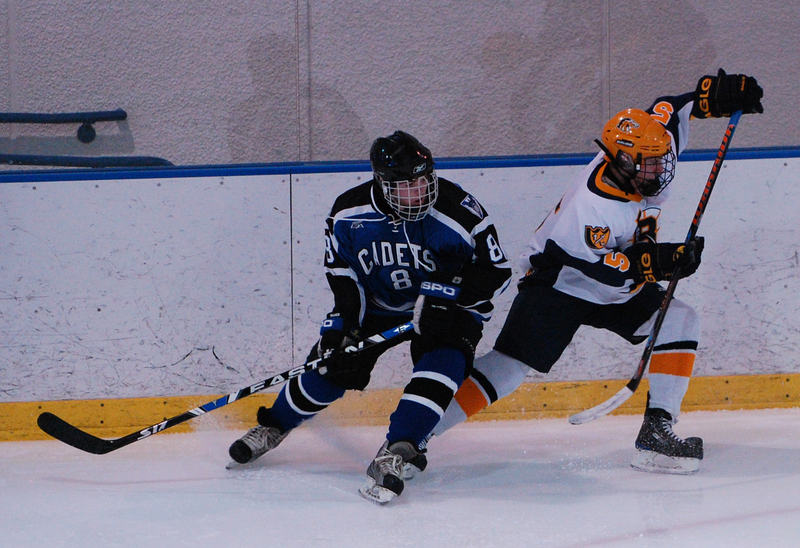 The winning play started when Cadets defenseman Eric Shurhamer drilled a shot from the point toward the net. 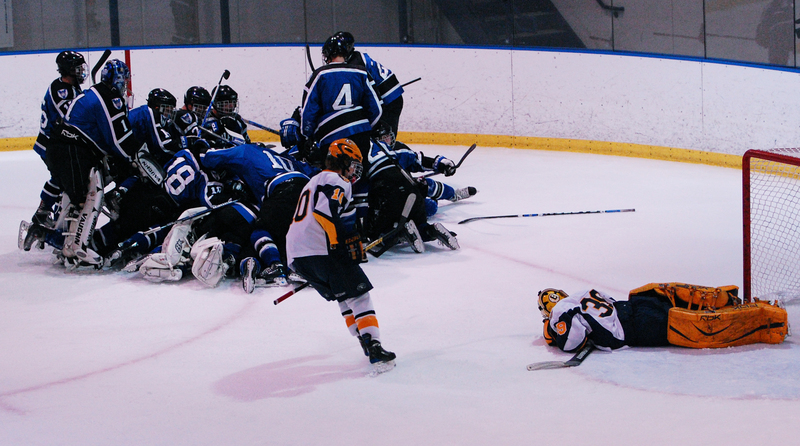 It got blocked in the crease and sat there until junior defenseman Taylor Fleming alertly raced in from the right point to grab possession of it. From there, well, this is where it gets ugly. 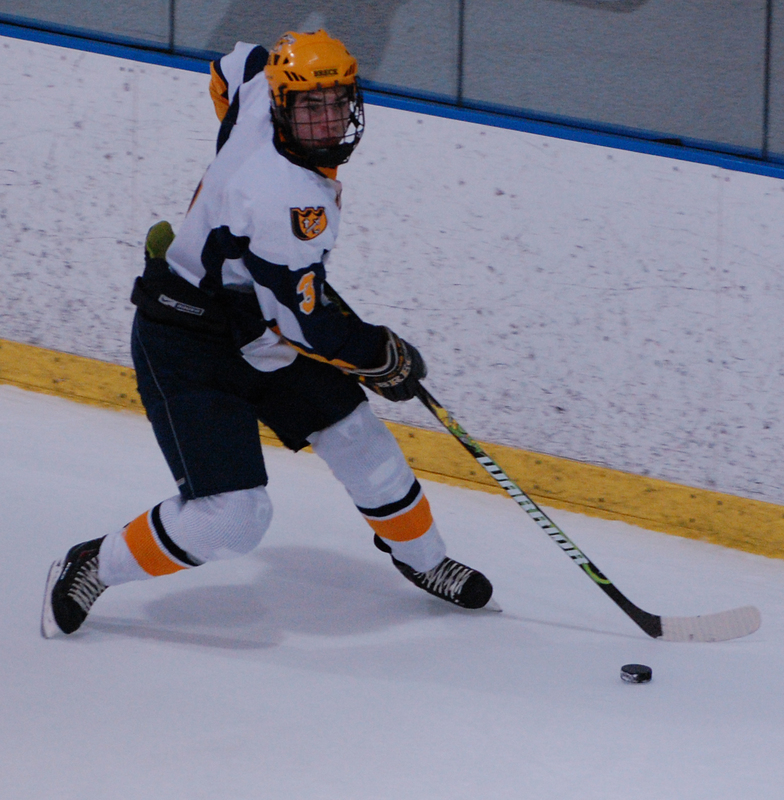 Fleming was trying to send the puck through the crease to Crandall when Breck defenseman Ben Gislason put his stick on the ice in an attempt to intercept the pass. 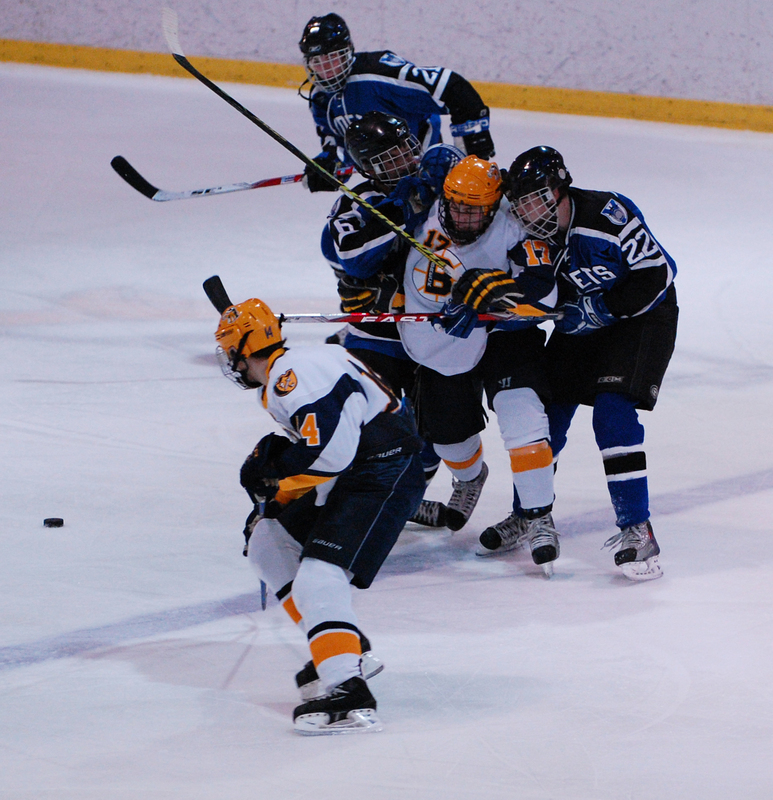 Instead, the puck glanced off Gislason’s stick and toward the net, eventually skidding in between Russell’s legs. 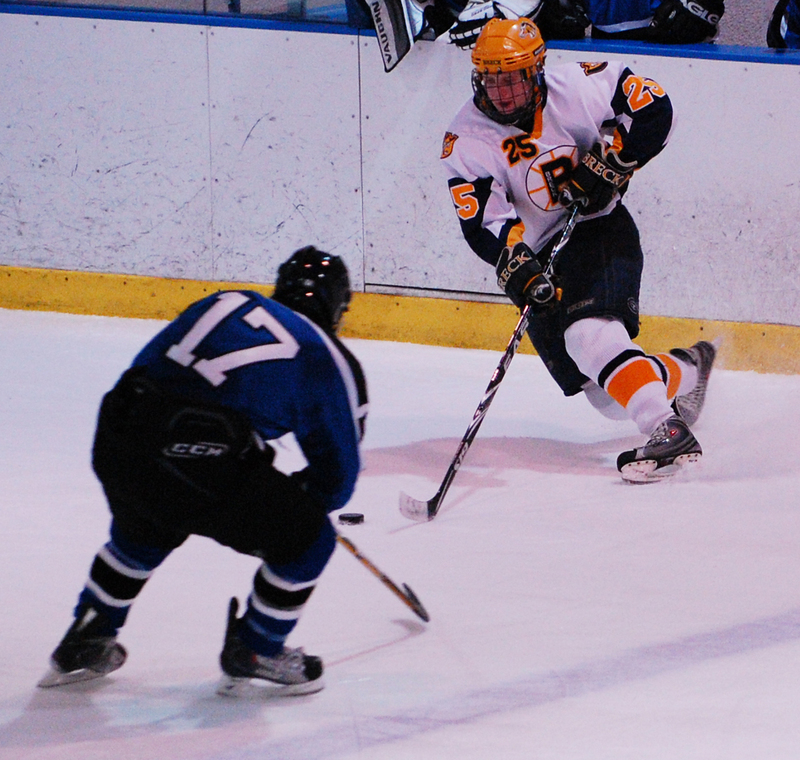 Crandall was credited with the goal on the scoresheet, but insisted afterward that it should go to Fleming. Ugly, indeed. “It was a luck goal, but …” Fleming said. 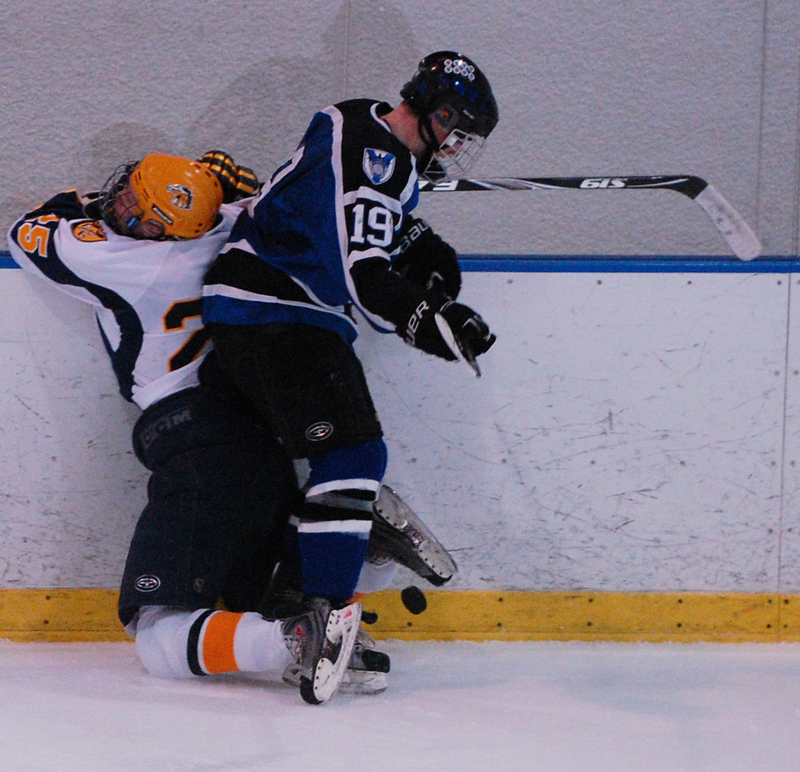 Unlike Crandall, he’ll take it. 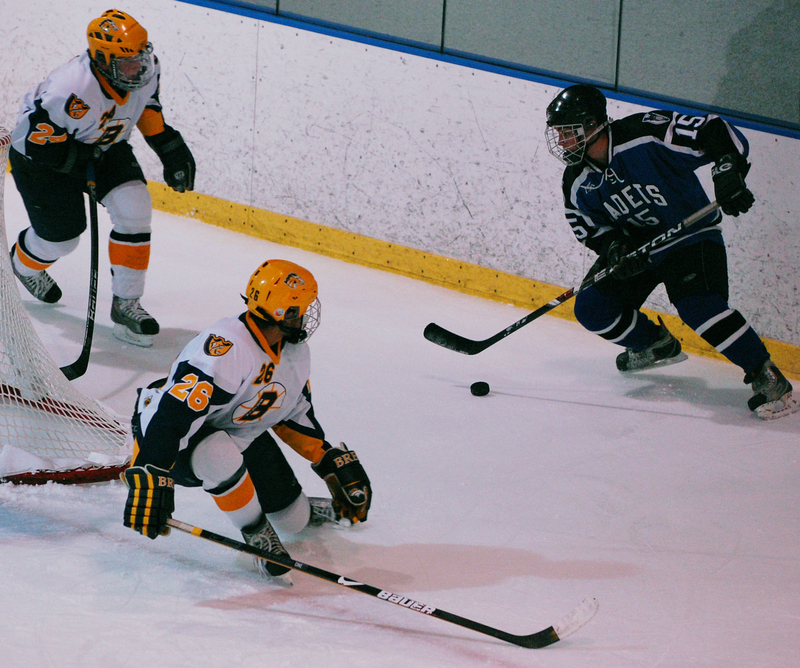 The Cadets, meanwhile, will happily take the win over a team they might very well see again in the postseasaon, should both reach the state Class A tournament as expected. Being on the winning end helps. 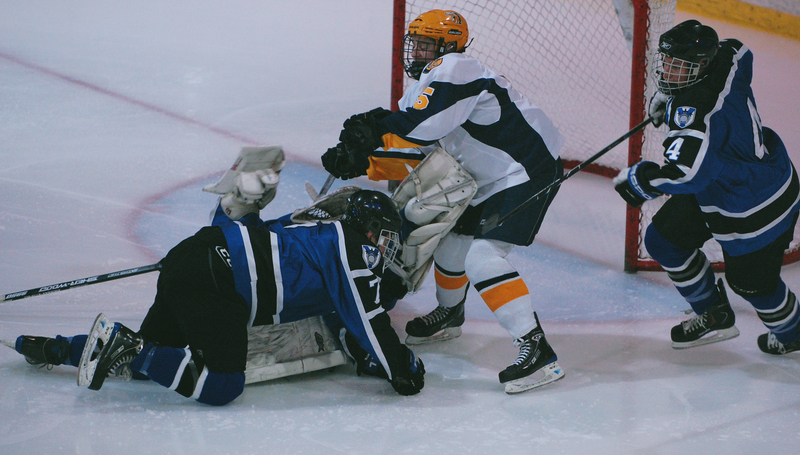 As for Breck, coach Les Larson wasn’t pleased about the 9-3 disparity in penalties (three of the Cadets’ goals came on the power play including the OT winner), but he couldn’t disagree about Russell keeping the Mustangs in the game. 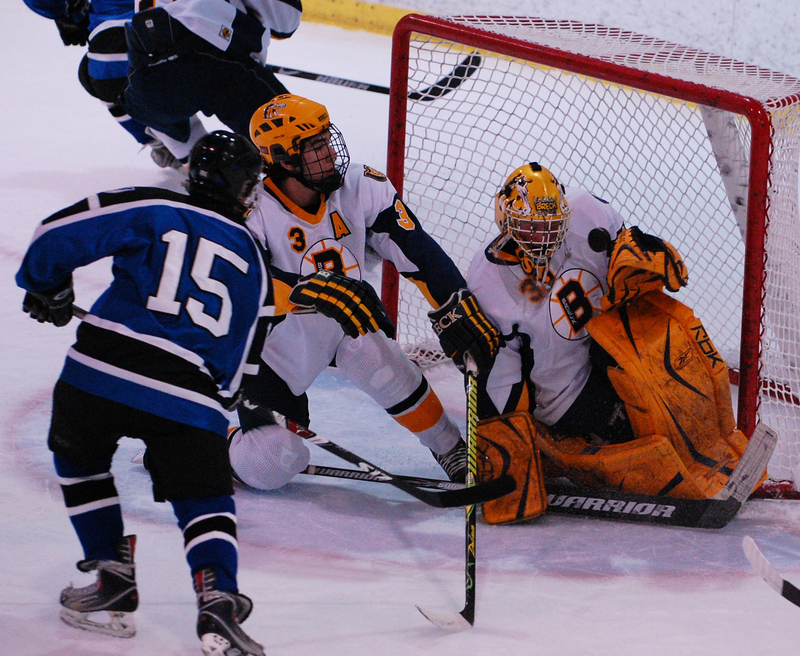 Breck goaltender made 56 saves, inspired the Mustangs' student section to chant "Johnnnnny Russell, Johnnnnny Russell" much of the night and was described by St. Thomas Academy co-head coach Tom Vanelli as the best player on the ice. 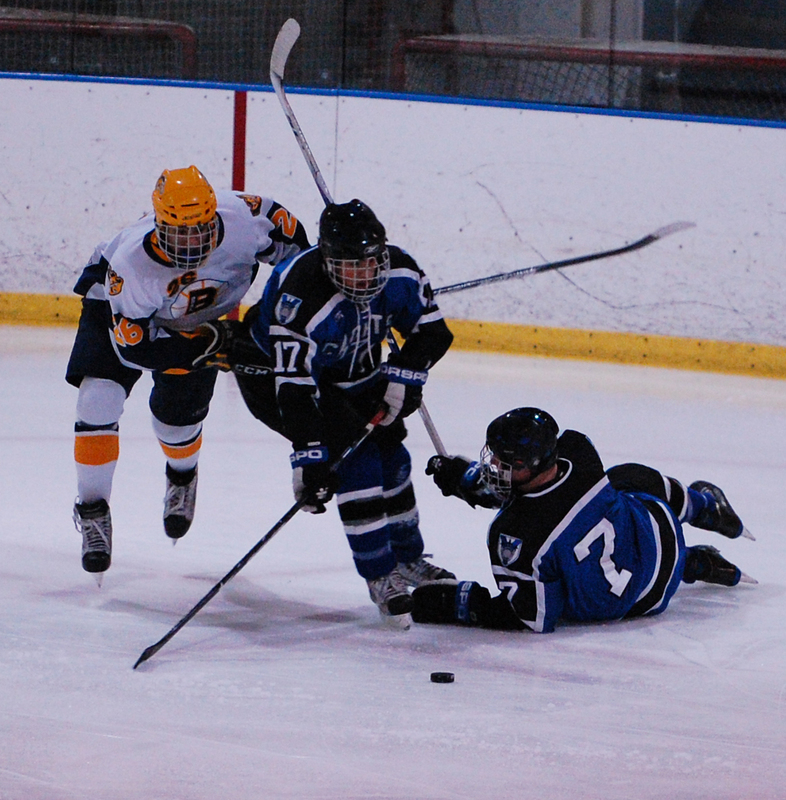 St. Thomas Academy junior forward scored twice in the second half of the third period, including a highlight reel backhand-forehand-backhand move around a Breck defenseman that was so good it even drew nods of approval from the Mustangs cheering section. 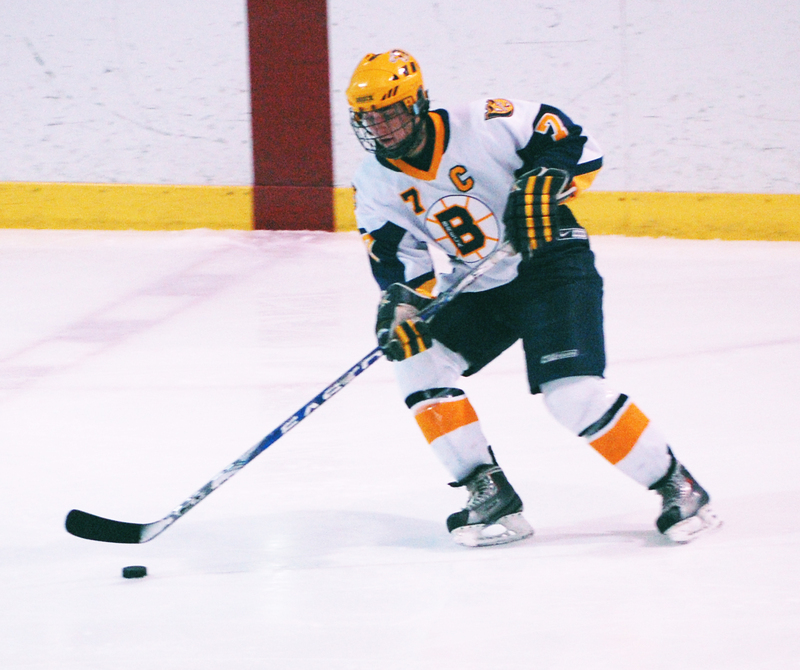 Cadets junior defenseman didn't figure in the scoring but his textbook defensive zone play and puck rushing skills were big reasons why the normally explosive Breck offense struggled to consistently generate scoring chances. 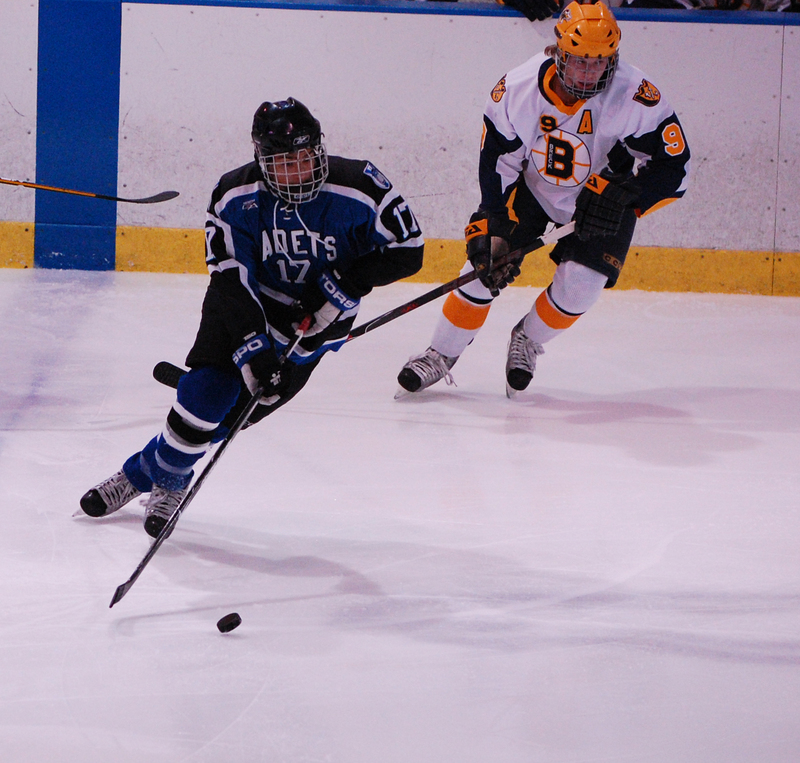 St. Thomas Academy co-head coach Tom Vanelli started a forward line of seniors Justin Crandall, Christian Isackson and sophomore Peter Krieger, but a "second" forward that includes juniors and Upper Midwest High School Elite League standouts A.J. Reid and Zach Schroeder was equally explosive. "We’ve got two first lines," Vanelli said. "That’s what people are going to find out. They aren’t going to know who to stop." 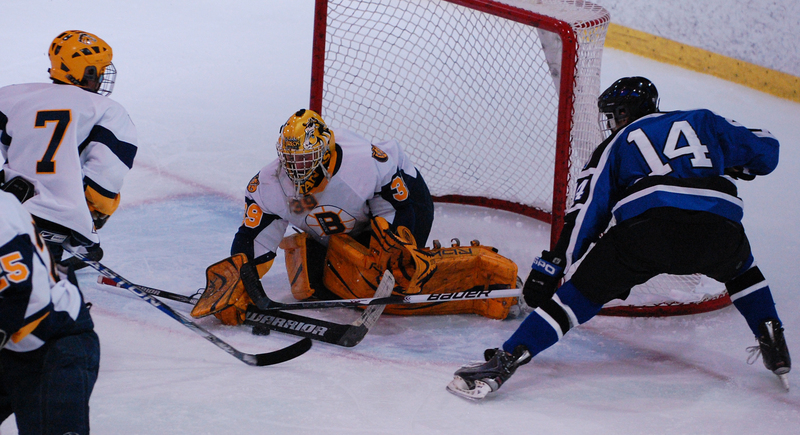 Isackson, who has committed to play at Minnesota, and Breck senior Tyson Fulton, who is being recruited by UM-Duluth among other Division I programs, each displayed their goal-scorer's touch with beautiful top shelf shots that had no chance of being stopped. Those two players are among what is expected to be a dozen or more combined from the two teams that will end up playing at Division I programs.